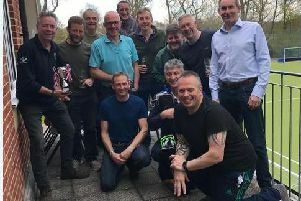 The conclusion of the 60th year of the Benevolent Darts League – formerly the Bognor Regis & Chichester Old Folks Darts League – was a blind trebles knockout followed by the trophy presentation at Newtown Social Club. Some 81 players took part in the knockout, an excellent turnout including 14 former champions. The first semi-final saw Conner O’Hara (the Legends), Rob Collins (Friary ‘Z’) and Terry Smith (Aldwick Legion) beat Esme Davis (Richmond ‘B’), Rob Rice (Chi Snooker Club) and Andy Cooper (Claremont). The second semi saw Andy Chant (Aldwick Legion), Wayne Wadsworth (Friary ‘Z’) and Jamie Middleton (Newtown ‘C’) get the better of Stuart Gray (QE2 Galleon), Colin Mace (Friary ‘Z’) and Debbie Ling (BRSA Jokers). In the final, Collins beat Chant at the bullseye to start the match. O’Hara hit the first ton of the match on his first throw, while Middleton followed with 81. Collins hit the only 180 of the night and Chant followed with 121, but that still left them behind. On only his third throw Collins hit double ten to take the first leg. The second leg saw Collins start with 83 and then a 140, and although O’Hara and Smith were not on form, nor were their opponents, who couldn’t score more than 60. Collins missed the bullseye for a 118 out-shot and Smith was so close to finishing the game, but it was O’Hara who hit double five with his second dart, winning the game 2-0, making him, Collins and Smith this year’s blind trebles champions, taking home £210 between them. Another great selection of raffle prizes were won, as were a lovely selection of trophies supplied by Aford Awards, the owners of C&M Trophies of Littlehampton, for the presentation. Final league positions: Div 1 winners - Friary ‘Z’; runners-up - The Legends; Singles winners - Friary ‘Z’; runners-up - The Legends; Pairs winners - Friary ‘Z’; runners-up - Hunston Hares. Div 2 - Overall winners - QE2 Galleon; runners-up - BRSA Ravens; Singles winners - QE2 Galleon; runners-up - BRSA Ravens; Pairs winners - QE2 Galleon; runners-up - BRSA Ravens. Div 3 - overall winners - Newtown ‘C’; runners-up - Pagham Cricket Club; Singles winners - Newtown ‘C’; runners-up - BRSA Jokers; Pairs winners - Newtown ‘C’; runners-up - Pagham Cricket Club.